When the word Aviation is said you automatically think planes, general aviation, civil aviation, but most often the word Cargo will not appear. But every day hundreds of flights, fly throughout the world delivering vital cargo supplies to your country. This DVD looks at one of the airlines that specialises in Cargo transportation. 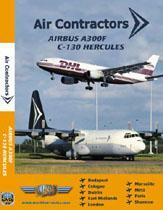 Air Contractors, an airline that flies Cargo flights on behalf of DHL, FedEx and other airlines. This DVD will only show 2 aircraft out of the fleet of 3. As the DVD starts the first few flights will be aboard the C-130. Below I review the cargo flights of Air Contractors using the C-130 followed by the Airbus 300F. Distinguishing the C-130 engine sounds from any other aircraft is simple, so when you hear an aircraft on final, and you hear the sound, you know what it is. So as the DVD starts we view the C-130 land and taxi in. From then we prepare for its departure, viewing how the aircraft is loaded, prepared, and the crews job all before the engines start. On comes the cargo, amazing how much cargo can be held in a single C-130, followed with Pre-Flight checklists. We then meet the C-130 load master, who’s job is very important. Basically he is needed to load our aircraft evenly, so in flight the aircraft won’t be to heavy or too light in certain places. But this is very important on the ground also; as I’m sure you have all seen what happens to an aircraft when it is loaded wrong! Very embarrassing! We are then given a full walk around of the aircraft with the pilot as he explains what the objective of a walk around is and what to look for when doing it. As we move on, the engine start sequence is very impressive, as you hear those four big engines get ready for their flight. Climbing out looking at the airport overview from the cockpit, what amazing scenery, as you can pick out each aircraft and its airline. Climbing up and out of the city, listening to ATC, viewing the towns below, what comes nearer to actually being on the flight deck? Cruising in the night looking at the lightened city below is one thing you don’t get to see from your own home. We then meet the First Officer of our flight who gives us a detailed run-down on the controls, dials and switches aboard the C-130 and what they all are used for and what they all do. When this is happening you are able to view all the dials clearly as the cameras give you just the correct amount of lighting needed. C-130, the C-130 carries objects of strange shape and size but the A300 carries Cargo Pallets, which are all neatly fitted inside the hold. On the flight deck the cockpit is nicely illuminated as we prepare for departure. 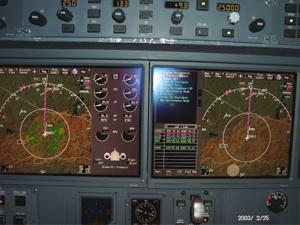 By comparing the two cockpits, you’d imagine the C-130 is harder to fly than the A300, who knows. Strange how the cockpits of two aircraft make them look so much different in the overall flight dynamics. Another very different thing is the engine noise, as above you have the C-130 propeller sound, compared to the 2 Rolls Royce engines, I know what I prefer. We use this aircraft on 6 flights, and the C-130 on a total of 12 flights. As we watch 3 flights inside the A300F from Cargo loading to Cargo Unloading. We then go outside with the flight engineer who gives us a very detailed walk around of the A300F explaining what he looks at, and why. We then go on a flight, and in mid flight meet the Engineer again, who this times give us a detailed explanation of his Engineers Panel, then we meet the First Officer and Captain who give us some information on the main panel and what each dial does and is used for, very interesting to see the difference between the two panels. As we watch the final flight come into land, it really is amazing to think some of that cargo maybe becoming to you. That is just a little information on what this little Disk has to offer you. A total of 180mins of non stop aviation, flying 2 different aircraft and meeting many people worldwide. All for a small $35. I personally know, no other way of being aboard 21 flights, at the comfort of your home. A big yes for aviation enthusiasts. JustPlanes – For letting me review this product.